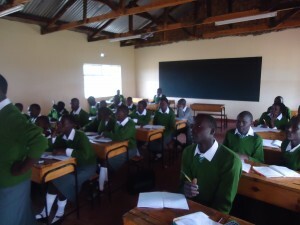 Suzy Peacock is our new high school near Eldoret. It is named after a lover of education, children, flowers, and art. Suzy died of cancer, and this school was started in her memory. I think it is the legacy she would have wanted. I’ve never seen children more excited about learning. Madame Maurine, their principal, reminds them every single day about the wonderful opportunity that they have simply because someone whom they have never met, their sponsor, gives money so they can eat and get educated. And they listen. They are grateful. Being in an assembly at Suzy Peacock is like being on Let’s Make a Deal. No matter what happens the crowd goes wild with laughter, claps, and joy. To put it simply they have found hope. One ponders how a bunch of orphans can be so happy. One ponders how a bunch of poor children devastated by AIDS in their area can be so smart. Suzy Peacock is only five months old, and its students are already scoring among the highest grades in Kenya. Their motto is “Limitless Desire.” That’s a lot like hope, isn’t it? These children had “unrelenting disappointment” for all of their lives. Disappointments for them came from poverty, disease, grief, and a lack of education. Then all of a sudden, they got a good break. A school was built. Someone sponsored them through CRF. And they are going to take advantage of the sudden good break. They are going to make sure that their lives turn around. I have never more vividly seen the results of a sudden good break. I don’t think I have ever seen how sponsoring a kid totally turns a life around. I hope you can give a child a break. Thanks for those of you who have.